I have had this recipe from busycooks.about.com for several years, but I wish I had thought of making this when my children were little! If your kids like canned pasta, then I assure you, they'll love this easy and healthier version! I love that the pasta goes in the crockpot dry, no preboiling! Also, I love that you control the ingredients! I like to use whole grain pastas, turkey or vegetarian meatballs, and even sneak in a shredded carrot or two. Perfect to start for the babysitter on a date night out, or put the finished spaghetti-O's into small serving containers and store in the refrigerator for quick lunches for your kids or yourself for the week. Be flexible in the amount or type of pasta or meatballs (optional) according to your preferences. Just be sure that the pasta is completely submerged in the liquid before you start the crockpot. For this post I used 2 types of pasta that I had little left over amounts of: a handful of leftover ABC pasta soup mix (I left the lentils,etc. in it, added nutrition, yet really almost unnoticeable to your family! Just increase the water by another cup)! as well as a left over handful of whole wheat elbows that needed to be used up. Combine all ingredients in 3-4 qt. slow cooker and mix to combine, making sure pasta is submerged in spaghetti sauce. Cover crock pot and cook on low 5-6 hours or high 3-4 hours. 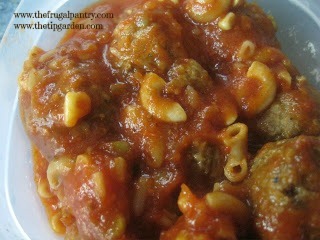 Pasta should be tender and meatballs heated through, Stir once during cooking time if possible. Jan's tip: Cooking it on low and slow will give more of a canned pasta taste and cooking it on high for less time will keep the taste more like fresh made spaghetti. But either way is very yummy.